Greg Gantt threw a homecoming party in Lakeland, Fla., on May 24, and he came with a $10 million gift. Old Dominion ranks No. 11 on the Transport Topics Top 100 list of the largest North American for-hire carriers. Gantt explained that he started in the trucking business as a manager in 1979 for another company at its Lakeland office. He worked here for a year before moving up the corporate ladder. Gantt joined Old Dominion as a regional vice president in 1994 and became chief operating officer in 2011. He was appointed CEO in March. 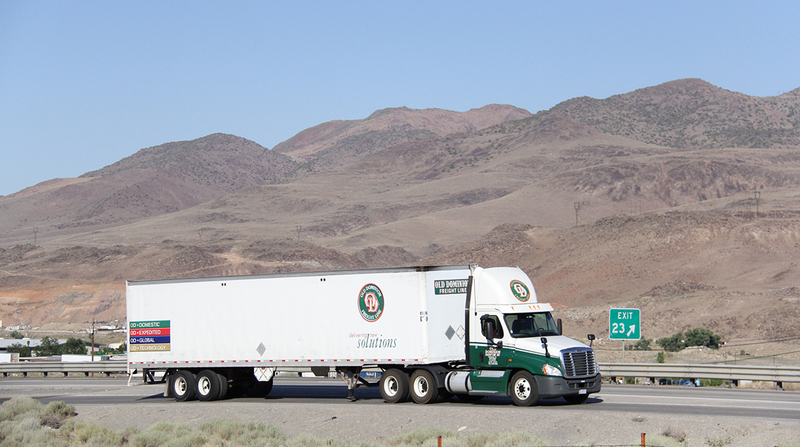 Old Dominion is a less-than-truckload trucking company, which means it picks up small shipments from one customer and consolidates its merchandise with cargo from other companies headed to the same location. The Lakeland service center is one of Old Dominion’s 231 centers across the country that handle cargo consolidation. The company built the almost $10 million center on 16.6 acres of a former pasture at 5260 N. Combee Road because it was running out of room at its Tampa service center, Gantt told The Ledger. It is Old Dominion’s 11th service center in Florida. Shipments from Polk customers previously went to that Tampa center for consolidation, he said. Michael Wood, vice president for the Southern Region, agreed. Old Dominion purchased such a large property in anticipation of that growth coming, Gantt and Wood said. The Lakeland service center, which already has 52 loading bays, has room to expand. Some of its local customers include Florida Caribbean Distillers in Lake Alfred and Auburndale, and Publix Super Markets Inc. in Lakeland, where it has bakery, dairy, deli and fresh foods distribution centers. Old Dominion does about $10 million in business with Publix, according to the company. The Lakeland service center will employ 33 people initially, said Joshua Thompson, the facility’s manager. All of the current 33 employees are transferring from Old Dominion’s Tampa and Orlando centers, he said, but most of them live in Polk. Future expansions will mean more jobs for Polk residents, Thompson said. An Orlando, Fla., native who came from an Old Dominion center in Alabama, Thompson moved to Lakeland and expressed happiness at returning to his central Florida roots. Gantt and Thompson weren’t the only people waxing nostalgic May 24. Lakeland City Commissioner Michael Dunn said he remembered as a child driving with his grandmother along I-4 and noticing the Old Dominion trucks. He also played with model railroads, including a set with an Old Dominion freight car. Dunn saw the possibility for a partnership between Old Dominion and the municipal Lakeland Linder Regional Airport, which is building a new air cargo facility. The city will start construction of $13 million in infrastructure improvements for the project in July, airport Director Gene Conrad said May 24. Construction on two facilities — an air cargo hangar and a maintenance and repair center – will come later at an estimated $25 million to $30 million. The cargo business has been pretty good for Old Dominion, Gantt said. In the past 10 years, the company’s market share has more than doubled to 10%. Old Dominion’s first quarter was one of its best in recent years, he added. Revenue grew by 23% to $925 million, tonnage by 15% to 2.3 million and total shipments by 11% to 2.8 million deliveries compared with the same quarter a year earlier. For its fiscal year ending Dec. 31, revenue grew 12% to $3.4 billion on 8.4 million tons shipped, up 7.4%, and 10.7 million shipments, up 6%.